Formen (Galeri Le’Laki) is specializing in men’s clothing and it has been selling its products since 2004, such as t-shirts, executive suits or shirts, jeans, men’s accessories, and many more. This factory outlet is not only visited by local tourists, but also visited by foreign tourists from Singapore and Malaysia, and so on. Remarks : Jalan R.E. Martadinata will usually be crowded on weekends. You can find Bandung souvenir stalls alongside the road. The parking area is small so visitors can park their car at The Summit or around the store. Glow is one of the factory outlets in Dago, Bandung (Jl. Ir. H. Juanda), which can be noticed from its colorful painted walls, such as pink, green, yellow, and purple, both on the exterior and the interior walls. This new factory outlet was established in 2012 and it sells various clothes and accessories for mainly middle-up class families. Glow is often visited not only by the locals, but also from other countries. Remarks : credit card payment is available. The factory outlet usually will be crowded on weekends. Grande sells a wide range of clothing for children to adults. In addition, visitors can also rest on chairs located next to the fish pond built here. Remarks : Jalan Ir. H. Juanda will usually be crowded on weekends and public holidays. Happening sells various clothes, for both men and women. You will find local brands (Fashion World, Dave Keene, etc.) and international brands here, starting from casual to formal clothes, as well as dresses with sizes ranging up to "3XL". Apart from clothes, they also offer shoes, sandals, and many kinds of accessories, such as hats, belts, and so on. It is said that Happening is often visited by middle-up class families. Remarks : credit card payment is available. Happening usually will be crowded on weekends. Heritage is a factory outlet that occupies an art deco building, a tipical architecture built during the Dutch occupancy era. Inside the Heritage, there is also a rest area decorated with chairs and has a “mini waterfall”. Heritage sells a various kinds of clothing and accessories. Women’s clothing on the first floor and men’s clothing on the second floor. On the left side of the store, there is a boutique named Cascade, a part of Heritage factory outlet. Remarks : Jalan R.E. Martadinata will usually be crowded on weekends. You can find Bandung souvenirs stalls alongside the road. Jetset sells a various clothing, such as jackets, t-shirts, shirts, and so on,as well as accessories, such as belts and glasses. Visitors can find women’s clothing in the first floor and men’s clothing in the second floor. 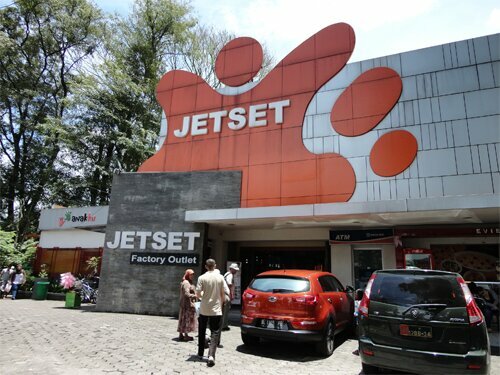 Located within Kampung Gajah complex, this factory outlet was established in 2010 and today it sells a wide range of branded clothes (casuals, suits, dresses, swimming suits, etc.) and accessories. Kampung Gajah Fashion is often visited by local visitors and tourists from many cities of Indonesia. Remarks : credit card payment is accepted. Kampung Gajah Fashion usually will be crowded on weekends. Founded in 2010, Level offers plentiful of clothes and accessories for men and women. Women clothes and accessories are located on the first floor, while men clothes and accessories on its 2nd floor. Bigger size clothes up to size "4XL" are also available here. If you are looking for new arrival items, you can find them in the front area of the factory outlet. It is said that their products are seek by many customers, especially the domestic middle-up classes. Many foreign customers, such as from Malaysia, Singapore, Vietnam, Brunei Darussalam, are also a common view here. Remarks : credit card payment is available. Get special offers, such as midnight sale and special discounts up to 20% in Car Free Day event (starts from morning till 10am) Bandung. Halo Palupi, terima kasih untuk partisipasi dalam komentar dan kunjungan ke JoTravelGuide.com, mengenai belanja lewat online mungkin ada pembaca lain yang tahu alamat-alamat belanja online? Halo Sofyan, selamat berbelanja di Bandung dan terima kasih untuk kunjungan ke situs kami dan pesan-pesannya disini. mau lihat produck-produck baju dewasa/anak laki-laki dan perempuan anak dan dewasa.thank! © 2008-2016 RixBoroh - All Rights Reserved.